When does this stuff move from kooky — to compelling?? Received 5 November 2010; revised 10 April 2011; accepted 11 April 2011. Available online 22 April 2011. Three approaches are used to test whether or not human populations across North America were affected by abrupt climate change and/or other environmental factors associated with the onset of the Younger Dryas (YD) cooling episode at ca. 12,900 cal BP. They are: (1) frequency analyses of Paleoindian projectile points from across North America; (2) time series of lithic assemblages from eleven Paleoindian quarry sites in the southeastern United States; and (3) summed probability analyses (SPA) of radiocarbon dates from cultural (human-related) sites across North America and parts of the Old World. The results of each analysis suggest a significant decline and/or reorganization in human population during the early centuries of the YD, varying in extent by region. 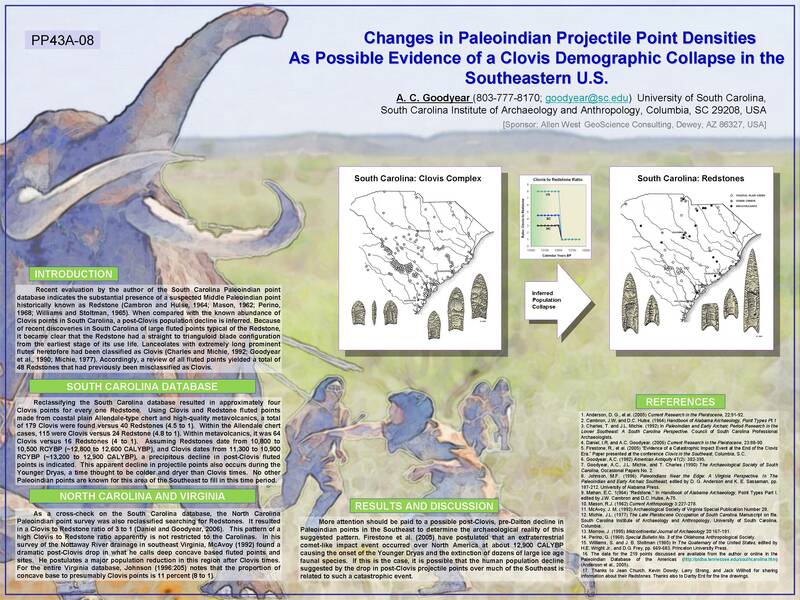 Archaeological settings formerly heavily utilized, such as stone quarries in the southeastern U.S., appear to have been largely abandoned, while over large areas, a substantial decline occurred in the numbers of diagnostic projectile points and cultural radiocarbon dates. Later in the YD, beginning after about 12,600 cal BP, there was an apparent resurgence in population and/or settlements in many areas, as indicated by increases in projectile points, quarry usage, and human-related radiocarbon ages.